Once a highly regarded apartment complex, Broadway Station began life as an extraordinary gated condo development between 2000 and 2005. Renovated and updated, these 1 and 2-bedroom condos, and, occasionally, a rare 3-bedroom unit, are incredible bargains, selling for $60,000 to slightly over $100,000. Floor plans are spacious and offer things like vaulted ceilings, hardwood flooring, fireplaces, gourmet kitchens, and granite countertops. Some condos come with a garage. Students attend Myrtle Beach Elementary. Middle, and High Schools. Residents enjoy a community clubhouse with a hot tub, pool, outdoor entertainment areas, and a fitness center too. Only about a mile from the beach and a short drive to shopping, banks, restaurants, and grocery stores, the complex is in the heart of Myrtle Beach and conveniently located to everything you could possibly need. 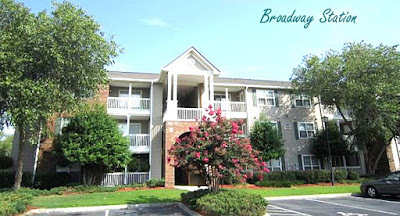 Broadway at the Beach and all the most popular tourist attractions are just a short drive away. A pond with fountains provides tranquil water views from many of the units. This is an ideal place for a primary home, an affordable vacation getaway, or a great long term rental investment. To learn more, please visit our website. Call our real estate professionals to schedule your private tour of the condos for sale in Broadway Station in Myrtle Beach. Step up to the good life!